This book introduces several topics related to linear model theory: multivariate linear models, discriminant analysis, principal components, factor analysis, time series in both the frequency and time domains, and spatial data analysis. The second edition adds new material on nonparametric regression, response surface maximization, and longitudinal models. 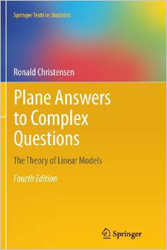 The book provides a unified approach to these disparate subjects and serves as a self-contained companion volume to the author's Plane Answers to Complex Questions: The Theory of Linear Models. This book presents a comprehensive examination of basic statistical methods and their applications. It focuses primarily on the analysis of variance and regression but also includes discussions of basic ideas in experimental design and of count data. This book examines statistical models for frequency data. The primary focus is on log-linear models for contingency tables, but in this second edition, greater emphasis has been placed on logistic regression. Topics such as logistic discrimination and generalized linear models are also explored. This book contains new material on screening designs, old but unpublished work on "powers of primes" designs, and material removed from newer versions of Analysis of Variance, Design, and Regression, Plane Answers to Complex Questions, and Advanced Linear Modeling. Course notes for Industrial Statistics.